Louisa May Alcott Came to Lunch! 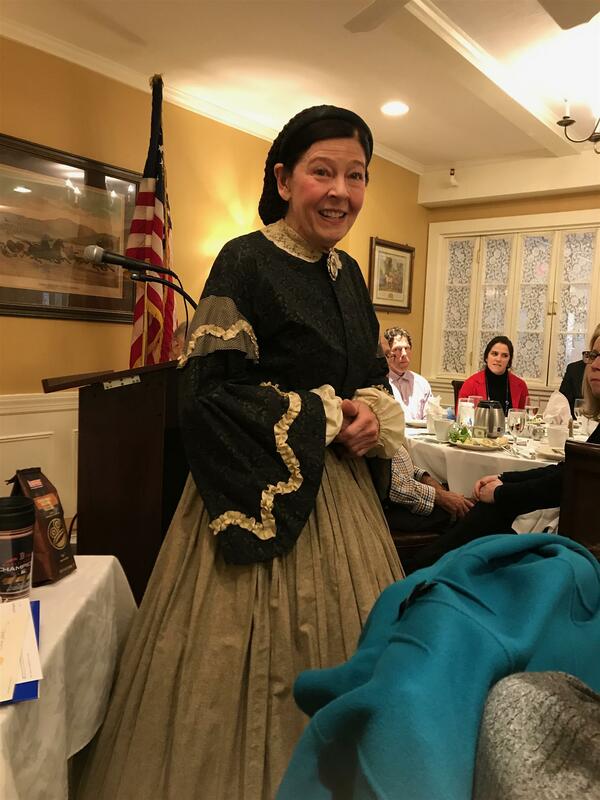 We were surprised when a breathless Louisa May Alcott came bustling into Rotary's meeting March 21after having some trouble with the wheels on her carriage. She told us about her book and how it was based on her life, with some fictional additions to make it flow better. She also said she served as a nurse during the war although she would have preferred being a soldier. She remembered taking care of Henry Dane when he was hurt in combat, but he at first didn’t remember. After Louisa left, Jan Turnquist, Executive Director of Orchard House, showed up and told us about the filming of the newest Little Women in Concord and Harvard. A replica of Orchard House was built on Lowell Road since the actual historic home would be compromised by all the activity of a film crew, lights, etc. The movie, starring Meryl Streep, will be released December 25th. It was suggested that a local screening be held to raise money for the House.